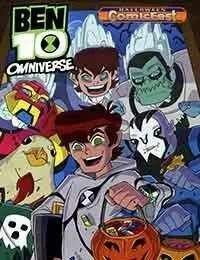 Ben 10: Omniverse Halloween Special! When he was ten years old, Ben Tennyson discovered the Omnitrix, a device that saves and catalogs DNA and then can distribute those powers and attributes to its owner in times of need. Ben becomes a superhero, battling the forces of evil for the next 15 years. Now living in Undertown, a hidden alien community on Earth, sixteen-year-old Ben is saddled with a new partner Rook, a by-the-book plumber, an elite team of space-cops, and is tasked with patrolling Undertown to keep it safe and, you know, saving the universe when it needs it!